Okay, you guys. So I've been living in my grandmother's old house for almost a year now, and I've slowly been redecorating to suit my own tastes. 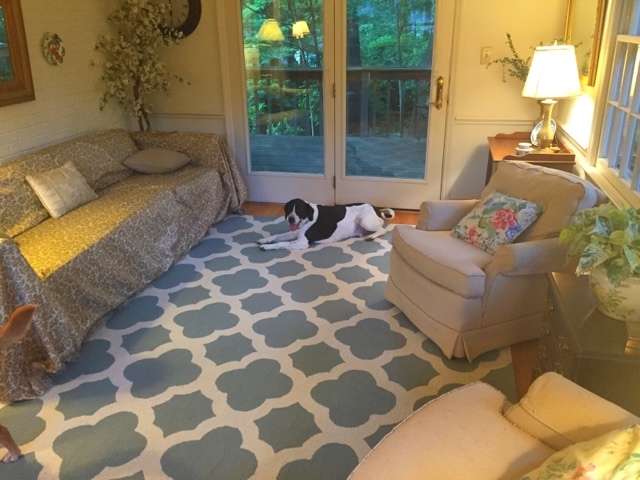 The rug that has been in the sunroom is an eyesore, and I finally found a rug I loved enough to buy in order to replace it. At the same time, the plaid sofa isn't really my favorite either, so I also bought a slipcover to tone down its "busy-ness". The update turned out better than I hoped. Quite a difference, I'd say. And the dogs seem to approve, as well (after all, they're the ones whose opinions really matter). 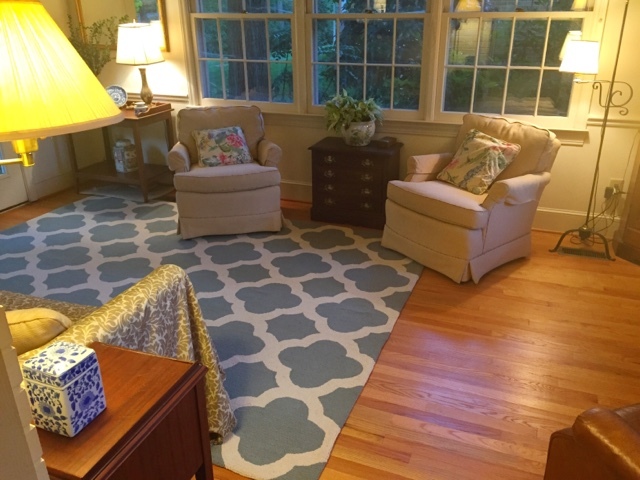 While the original rug was a 9x12, the new one is an 8x10. 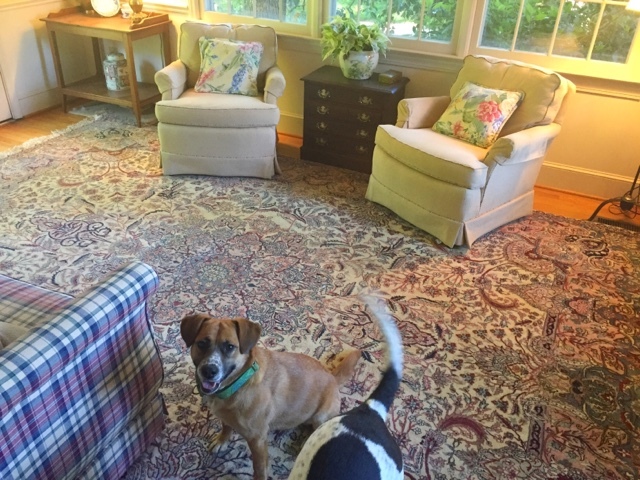 I was worried about the difference in size, but part of me wanted to give the hardwood floors more exposure. I'm still tinkering with the furniture arrangement (my mother insists that the rug be lined up with the sofa, while I'm having a hard time finding a way to make the armchairs match up to everything. 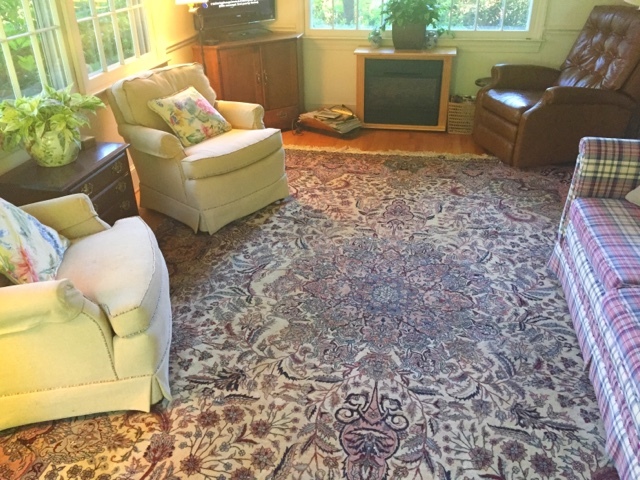 I do wish the rug were just a foot or so longer, but all in all I'm happy with the outcome. 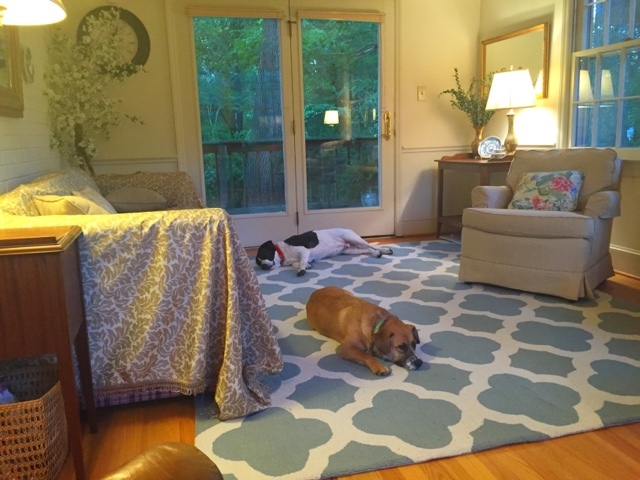 Now if we could just tackle those awful window treatments.. (and don't get me started on the dining room area rug). Oh well. You can't do it all at once. They say you should tackle home renovations one project at a time, in order to avoid making hasty mistakes. If one thing's for sure, it's that these projects are definitely taking longer than expected (due to time and financial constraints). Then again, Rome wasn't built in a day. Here's to challenging my resistance to "delayed gratification".